My younger brother, Orion, was the first person in my family to try being vegan. And, this is one of the first purposefully vegan recipes I ever concocted, so that he would have something tasty and nutritious to eat at family dinners. Rice and beans both have protein, but when eaten together they provide essential amino acids that your body needs. The rice and bean tag team has been a staple in the diets worldwide for centuries. Go rice and beans! This recipe is pretty basic, but it’s filling and flavorful. In a large pot, bring the water to a boil. Stir in the wild rice and brown rice, return to boil. Cover, and reduce to a simmer. Stirring occasionally, cook for 45 minutes, or until there is no longer any water left standing. Open the cans of black beans, but do not drain them. Mix the entirety of both cans of black beans thoroughly into the rice. Return to simmer, and cook for 15 minutes or until there is no longer any water left standing. Remove from heat. Once you’ve started the rice, you can work on the vegetables while it cooks. Wash and chop the green bell pepper, yellow bell pepper, and red onion. In a large frying pan, warm the extra virgin olive oil. Sauté the chopped peppers and onion until the onion becomes translucent. 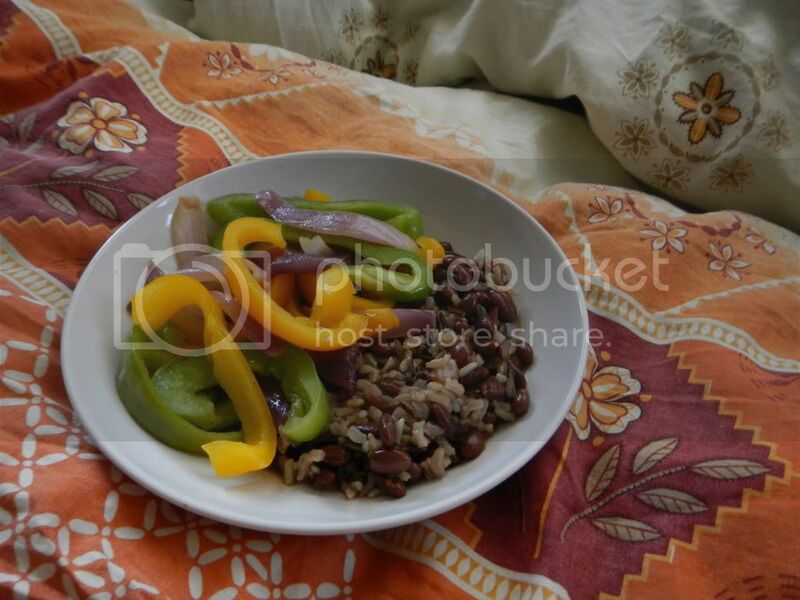 Top the rice and beans with the sauteed vegetables. Add salt and pepper to taste. Depending on who I’m serving, I tend to use 1 to 2 teaspoons of salt, and 1/2 to 1 teaspoon of freshly ground black pepper. Or, simply leave the condiments out, and allow people to help themselves.